Do you ever get that feeling that they're just not listening to you....? Please tell me that's not just me. I mostly have a group one student who listens to every little word I say (and then holds it against me/corrects me/reminds me about every little thing I say), about 4 kids who mostly pay attention, 5 kids who sometimes pay attention, and 12 kids who hardly ever pay attention. I really don't know why the gunk on the bottom of their shoes is more interesting that ME!!!! Plus, we're starting subtraction with... wait for it... REGROUPING when we get back!!! Eeeeeek! This always makes me want to cry/pull my hair out/retire. It's a (paid) app on the iPad that allows you to explain everything- or anything you want. In this case, subtraction with regrouping! I created it, exported it to YouTube, and I'm going to have my kiddos watch this on their iPads for their seat work station on Monday. I feel like watching this video will go over a little better than me trying to keep their attention whole group (or even small group these days!). We'll see! 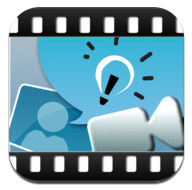 But you could even project a video like this onto the board or SMART board whole group (if you only have one iPad). It's no BrainPop, but I feel like they'll listen better and (hopefully) absorb some of this regrouping shennanigans! Educreations! It's very similar to Explain Everything (but it a bit more limited) and it's FREE! Next step is to have the KIDS start creating these videos to show their thinking and learning! How do you get your kids to pay attention (besides dancing and singing and tap dancing and acrobatics and jumping around like at Jazzercise to keep them engaged- I do all of those things on a regular basis too! :-) ??? I love these ideas! We started regrouping before the break, but I am sure they have forgotten 90% of it. We don't have ipads but we have one to one netbooks - so I will have to see what we can do with it. LOOVE the idea of them creating their own presentation. So glad I found your blog today! I am your newest follower and I have you bookmarked! Love it! OK, I'm so jealous! How many iPads do you have in your classroom? If they are able to view this on their own iPads, you must have a ton. Hello...jealous. OK, now that I'm finished with that...this app is fantastic! 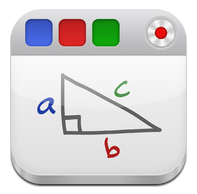 I like it so much more than Educreations. It's not too expensive, either. Thanks for sharing! Sandy, I love your movie! I have been dreading teaching subtraction with regrouping as well. I created a QR code for the movie, because I would like to share it with my students as well (if you don't mind). Let me know if you want a copy of it. I have been experimenting with the Show Me app. Have you tried that one? If so, which do you like better? Show Me or Explain Everything? I sat mesmerized watching your video! What a wonderful idea for seat work! Then if someone is absent, they don't miss your lesson! Brilliant! 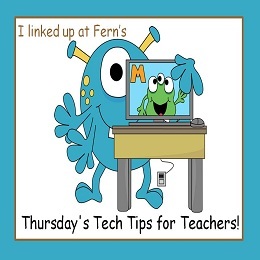 Thank you so much for linking up at my new Thursday's Tech Tips for Teachers! I can't wait to see what I learn from you next week! Boo to subtraction with regrouping! Cry cry cry,pull pull pull for sure! The video is great! I don't have an ipad myself nor do I have any in my room :( but definitely good to project on the board! Good luck in your subtraction adventures, I will be starting mine in just 2 weeks! You always have creative ways to reach your kiddos! I love that about you. Your kids will be so motivated to learn subtraction because of this little get up you got going on. Good for you! We need more teachers like you out there. Love ya! Oh cool you have iPads in the classroom. Regrouping is difficult for some kids. You could try giving them some dimes and pennies and asking them to take away more pennies than they have, then they will have to trade or regroup? Will you be getting into skip-counting or multiplication this year? I created a game to help with that and now it's on the iPad. There's a free version and the full version is 99 cents.